I look outside my window and see the tall Kadamba tree blossoming with beautiful Kadamba flowers all over. This is the first in this season. Kadamba is one of Srimati Radharani’s and Lord Nitaynanda’s favorite flowers. 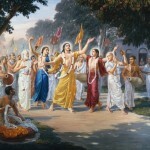 Moreover, Lord Sri Caitanya Mahaprabhu’s maha-bhava during Sankirtan was often compared with a Kadamba flower. The hair standing on His golden form reminded the poets of kadamba flowers! 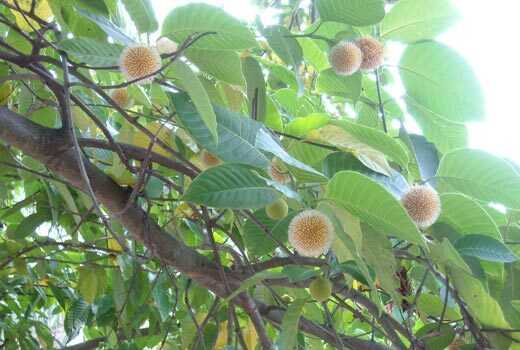 So blessed is the kadamba tree which bears such beautiful flowers. They are also one of the fastest growing trees in this area. 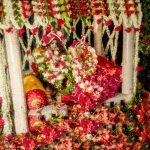 As the tree right in front my vision is as tall as a four-story building, and there is no way that I would be able to reach the flowers, I closed my eyes and made a medium size garland for Srimati Radharani and placed it on Her beautiful form. 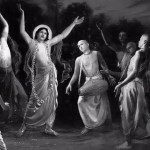 Then I made two very long garlands for Lord Nityananda and Lord Gauranga that would reach out to Their knees and decorated Them. I also got some flowers with leaves to decorate Sri Madhava’s turban! 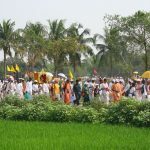 Let the fragrance of kadamba be blessed by gratifying the senses of Their Lordships! 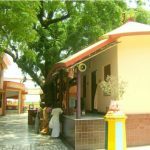 O Kadamba tree! You are limitelessly blessed by my sweet Lord! Devotional service is so easy and blissful! I opened my eyes, and felt as if Krishna really accepted this mental service of mine – why otherwise I would feel so much happiness by just looking at those beautiful kadamba flowers outside my window!